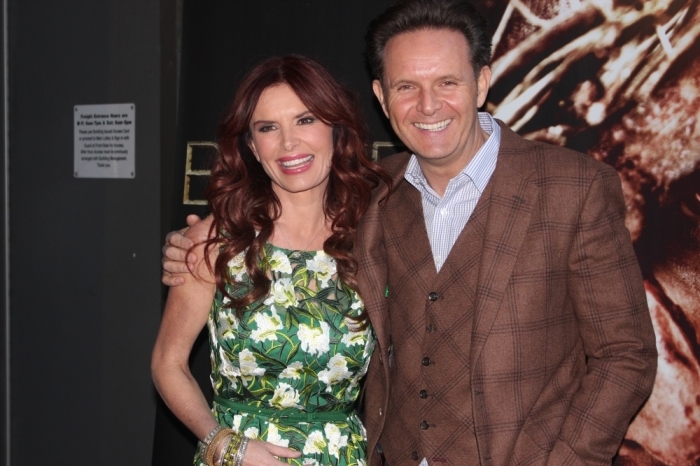 Mark Burnett and Roma Downey, the executive producers behind the Emmy-nominated "The Bible" series, are raising $25 million to help Christians displaced or affected by the ISIS terror group in Iraq, Syria and neighboring countries before the winter arrives. "The Cradle of Christianity Fund" will be distributed through an established network of traditional church communities, according to the Institute for Global Engagement, through which the Hollywood couple have launched the initiative. "This initial gift will be used exclusively to rescue those in immediate need while simultaneously beginning a process of restoration and healing through the documentation of both the atrocities inflicted upon their communities, and the stories of hope and courage found amidst such unspeakable tragedy," states the Fund's page on the Institute's website. Burnett and Downey recently met with Institute for Global Engagement president Dr. Chris Seiple, according to The Blaze. Johnnie Moore, the couple's chief-of-staff, and Seiple visited Iraqi Kurdistan and Jordan earlier this month to assess the needs, according to the Institute's website. There are more than 800,000 displaced people in Northern Iraq alone, many of whom are living on the streets, in churches, or in abandoned buildings. The number is constantly growing. "Nearly all of these men, women, and children have insufficient accommodations to survive the harsh Iraqi winter, as the aid community struggles to find solutions and resources," the initiative notes. "For example, by the UN's own account, if it operates at maximum efficiency in Northern Iraq, it will only be able to provide shelter and provisions for 40% of the IDPs [internally displaced people] in Iraqi Kurdistan alone, much less the other IDPs across the country. We are focused on the displaced and refugee Christians, and the communities that they serve." When Anbar Province fell to the terrorists last week, 160,000 more Iraqis fled their homes, it notes. "In today's Middle East, the majority of the Christian faith communities, which include Orthodox, Catholics, and Protestants, suffer violence, abuse and injustice from extremist Islamic forces by virtue of being Christian," according to Nina Shea of the Hudson Institute has noted. "Now facing an existential threat to their presence in the lands where Christianity has its roots, the Churches in the Middle East fear they have been largely ignored by their coreligionists in the West. The Christians of Iraq and Syria, in particular, are facing a deliberate campaign of religious cleansing at the hands of Islamist militants. This is a crime against humanity, as well as a tragedy for the Church. The West needs to recognize and speak out about the plight of this defenseless religious minority and find peaceful means to alleviate it." A U.S.-led coalition has been carrying out airstrikes on ISIS positions in the Kobani area, which borders Turkey, and elsewhere in Syria as well as in Iraq. Islamic State, or ISIS, an al-Qaeda offshoot which is also known as ISIL, has taken over hundreds of villages around Kobani in Syria, and over 150,000 people from the region have fled to Turkey. In Iraq, hundreds of members of the Christian and Yazidi minorities have also been killed, and tens of thousands of them have fled their homes. The Sunni terror group has gained control of large swathes of territories in Iraq and Syria. It wants to form an Islamic emirate in the Levant region through "jihad." ISIS has released videos showing the beheading of U.S. journalists James Foley and Steven Sotloff and British aid workers David Haines and Alan Henning.